In both the iOS version of Entanglement and the online Sakura Grove expansion, we've added new modes that twist the basic mechanics of Entanglement to explore new gameplay possibilities. We're really proud of how these modes turned out, so we thought it would be fun to take time to discuss what those modes are (for those who haven't played them) and some of design decisions that went into making them. We'd love to hear your thoughts on the new modes, so tell us what you think in the comments. We'll start with Sakura Grove. 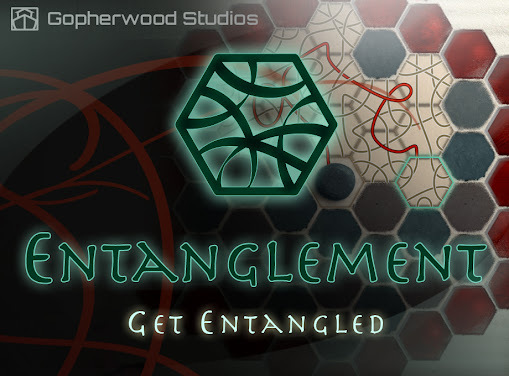 Sakura Grove introduces several new mechanics to Entanglement. First, players have a limited number of tiles. The player starts with seven tiles, and each play consumes a tile. When a player runs out of tiles, the game ends. New to the board are cherry tree tiles and the golden center tile. 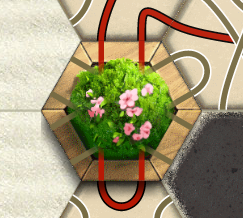 The cherry tree tiles are pre-placed tiles located around the board. They have straight paths running through them. If the path passes through a cherry tree the player earns an extra tile to place. 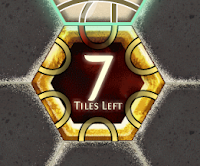 The golden center tile is the starting point for the player’s path. It has 'u' paths on all of its edges. Each time the player’s path passes through a 'u', the player earns bonus points (points worth specific amounts not related to the length of the move). The amount of points received increases with each ‘u’ the player passes through. 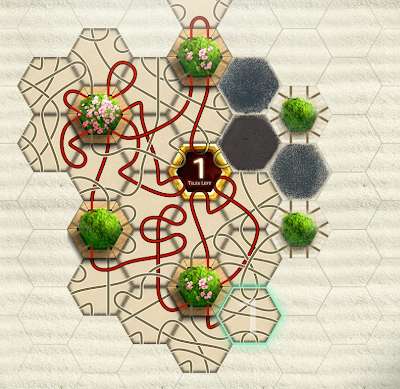 Finally, there are no borders in Sakura Grove which means the only way to lose is to run out of tiles. The final design for Sakura Grove came together like a puzzle with each piece falling into place over the course of a few weeks. The core idea was provide a wall-less mode that allowed players to focus on creating complex paths without the threat of walls ending the game prematurely. Needing a constraint to prevent players from playing infinitely, the tile count limitation seemed like a natural fit. The pre-placed tiles that would later become the cherry trees were the next addition. These were introduced out of concern that the board would lack texture if there were no elements for players to consider as they created their path. Wanting to introduce more purpose to the pre-placed tiles I (Todd) initially suggested that the tiles give points for passing through them with points earning you additional tiles at certain intervals (50, 100, 150, etc.). Derek, as he often does, ignored me prefering a simpler (read: wiser) solution and directly linked earning extra tiles to passing through the pre-placed tiles. Initially, it took two passes through the tile to earn a extra tile (this is still true in multiplayer), but we found that under these conditions single-player games ended too quickly because of the amount of work required to earn an extra tile. Also, expressing the mechanic was proving troublesome. Once we decreased it to a single pass, the game felt faster and more rewarding. While working on Sakura Grove we were thinking about how to make the new mode look unique, and we found that the pre-placed tiles provided a logical opportunity for this. Wanting to differentiate the pre-placed tiles from the standard tiles, we initially decorated them with bushes, which worked well with our Asian garden theme. On seeing the bushes, one team member suggested that the pre-placed tiles be cherry trees that bloomed as the player passed through them. Everyone agreed this provided appealing feedback and further enhanced the theme. In the end, these cherry trees (known as sakura) would provide the name for the mode and the expansion as a whole. The new mechanics significantly differentiate Sakura Grove from the classic Entanglement gameplay. The lack of walls gives the game a lighter, care-free feel. There is no fear of dying from a miss-click or a misread line. Instead, the end of the game is clearly forecast by the counter. What matters instead is that each tile be played as smartly as possible to weave through the board to rack up points and extra tiles. The shape of the board encourages you to create tightly knit bundles. These bundles pay-off in long moves earning large point values. Weighing what to pursue when (score easy tiles/points in the short term, or risk your limited tiles to set up a longer more valuable move) provides a mental challenge for those who hope to master it. Well, that’s Sakura Grove. Look for another post on Gold Rush from the iOS version in the near future. If you’re interested in checking out Sakura Grove, you can find it in the main menu of Entanglement by clicking on “More Modes”. Any hope of an Android version? Fell in love with this game when I saw it in the Chrome Webstore on my new CR48. The iOS version looks even more addictive and polished. I really want this on my android phone!!! I must've installed Entanglement through Chrome a short while ago as I saw it in my Apps this morning and thought 'what's that?' I'm glad I decided to investigate further as it's simply beautiful and a nice way to spend a sunday afternoon. My first thought was 'this should be on iOS' and i'm glad to see you're ten steps ahead of me! Entanglement is the perfect match for the iPad in my opinion. @Scott - we're looking into it: it's something we do want to do. Thanks Daniel! Glad you enjoy it! Hi Kate! Could you email the Google Account you're using to feedback@gopherwoodstudios.com so we can take a look into it? Thanks! Technically there is a second way to lose besides running out of tiles: if you run the path into the same curve where it started, the game ends. I don't understand HOW to switch to new modes...I don't see the option anywhere? Yes, I have bought them...Please help? :) Thank you! You should be able to click "Menu" on the right side of the screen and go to the main menu. Once there, select "Solitaire" and then pick the one you wish to play. If it's still giving you any problems, feel free to send an email to feedback@gopherwoodstudios.com and we'll look into your issue. Thanks! I bought Sakura and when I go to log in the screen just flashes and nothing happens, what's happening? Doesn't it last for longer than one day when you buy it?